Home for the Apollo geological samples — specimens that are physically protected, environmentally preserved and scientifically processed — is the Lunar Sample Laboratory Facility, a special building at NASA 's Johnson Space Center (JSC) in Houston. "Volatiles" are substances with relatively low boiling points — materials such as water, hydrogen and methane. Understanding lunar volatiles could improve the productivity and value of future human involvement with the moon, scientists have stressed. 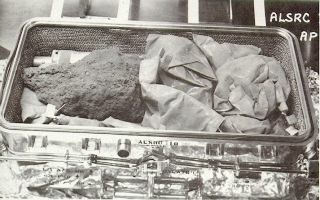 Editor's note: This story was updated March 6 to correct the name of Ryan Zeigler, NASA's Apollo sample curator and manager of the Astromaterials Acquisition and Curation Office in Houston.